Tactical Trekker: Duck-Hunting Gun More Destructive Than "Assault Rifle"
Duck-Hunting Gun More Destructive Than "Assault Rifle"
In an online discussion a couple of weeks ago, I had someone declare that semi-automatic weapons should be outlawed. I pointed out that that would include my Browning duck hunting shotgun that my Dad gave me when I was 14. 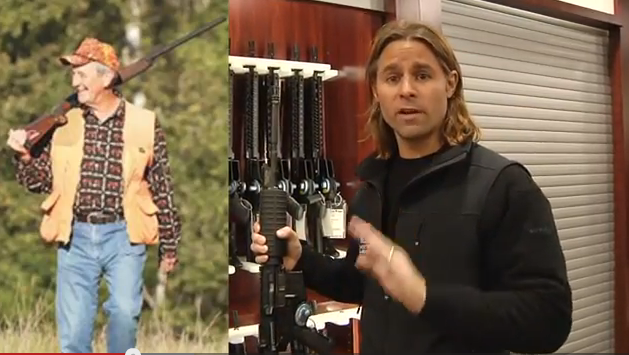 "Scary" assault rifle, right, versus duck-hunting gun. The uninformed -- especially the mainstream media -- have demonized the term "semi-automatic" because they really don't understand what it means: that the weapon fires every time you pull the trigger. The uninformed have confused this with full automatic which means that you pull the trigger and the weapon continues to fire for as long as you hold the trigger ... or until the magazine is empty. This morning, a friend emailed me a link to a video that demonstrates the comparative destructive force of a tricked out .5.56mm sporting/target/personal defense rifle versus a .12-gauge semi-automatic (built on a Browning patent, it looks like to me). This would have been far more persuasive re-cut to focus on the weapons and the target results. The preamble and the political speech after the demo are "preaching to the choir" and distract from the video's main -- and very solid, visible and incontrovertible -- message. The preaching contains enough hot buttons to turn off the undecided viewer. This doesn't matter with regard to the "ban evil guns forever" people who aren't going to look at this anyway. But to those undecided folks in the middle, a calm, neutral, fact-based video illustrating the two weapons could be a powerful eye-opener. It would offer powerful context to the "duck-hunting shotgun versus evil assault rifle" debate. A couple of other caveats: I use number 4 shot to hunt ducks, not 00-buck. While my Browning magazine holds five rounds, it has a removable plug to reduce the capacity to three rounds to comply with federal duck hunting regulations. And the ducks are flying (usually) at a distance of more than 20 yards. However, the shotgun analogy is especially relevant because most nut-case shootings are at close range which is where a shotgun's destructive power is most potent unless you're using a slug. A follow-on video comparing the .223 with a .12-gauge slug (perhaps at a frozen turkey) could be even more revealing. Here's the video (with preaching). The comparative demonstration begins at the 2:30 time mark.